DM IMPEX is one of the most reputed companies in India distributing a range of machines incorporating cutting edge technology for modern jewellery manufacturing. The state of the art equipment is manufactured by Bodor - Switzerland - China, HISPANA - Spain and credible manufacturers from Italy. DM IMPEX is a Crisil-verified, ISO 9001:2015 certified company. Since 2005 DM IMPEX has supplied its products to jewellers across the country, be it small workshops or large factories. The precision products supplied range from Laser Welders & Markers, Grinding & Pre-Polishing systems for Gold and Silver jewellery, Casting machines, investment removers, wax injectors etc. There are basic models and more advanced machines to suit different needs. These yield results of a higher quality, as well as ensure savings on time, space, manpower, electricity and costs. DM IMPEX’S clients are extremely satisfied both with the machines and the prompt and effective after sales service. Last year DM Impex introduced the FC and FS Laser Markers from Bodor, a world class global Laser manufacturer. These high quality machines are designed in Switzerland and manufactured in China. 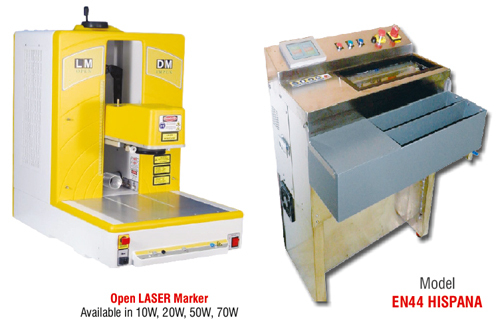 The company’s laser markers were introduced for the jewellery industry in India for the first time ever and they come with a 3 YEARS WARRANTY, which no other Laser Manufacturer offers in the country At IIJS 2017 DM IMPEX is introducing a new advanced grinding and polishing machine from Hispana which gives a number of added advantages to manufacturers. First Time in India Bigger and Better Grinding and Polishing machine for Gold Jewellery EN-44 enables easy, quick and high quality polishing of the inner surface of jewellery. Till now most companies do this manually, which is a time consuming operation and requires skilled workers. The advanced machine developed by Hispana de Maquinaria, S.A.is the only mass system that can polish the inner surfaces, reaching areas where it is not possible manually, thus enhancing the overall brilliance of the piece. 3) Uses the same racks as in 1st Step , saving costs and time for loading/unloading between the two stages A special version of EN-44Pd is available for polishing white gold Palladium alloys. With EN-44 you can increase production, upgrade quality, reduce cost, and always be prepared to process big orders while reducing gold loss.